"You and I have taken refuge in a hermetically sealed existence. Everything's been orderly, and it's all gone like clockwork. But the lack of oxygen has smothered us." In the early 1970s, internationally renowned film director Ingmar Bergman was in rather dire straits. He hadn't had a real arthouse hit since 1966's Persona, and the just-completed Cries and Whispers proved to be a difficult sell. So he decided to scale things back, and film a six-part series for Swedish television. He wrote a script for his long-time actors Liv Ullmann and Erland Josephson, and filmed it quickly, using 16mm film, on his beloved island of F�r�. It was shown at approximately the same time all over Scandinavia, and as legend has it, the streets were deserted every night it was on. Bergman had always been perceived as a heavy-handed, somewhat pretentious director, and his films were never very popular in his home country of Sweden. But suddenly the mythic characters, abstruse plot developments, and heavy-handed symbolism of his previous films were gone, replaced by a simple chamber drama that concentrated on the ups and downs of a middle-class married couple, and the voyages of discovery and growth that each goes on. It was a smash success, and supposedly family counselors all across Scandinavia suddenly found themselves extremely busy, and divorce rates jumped considerably after the showing. But Bergman was faced with a problem. At almost five hours, the series was far too long to be released theatrically, and foreign distributors were unwilling to subtitle or dub a film of that length. So he returned to the editing room, and judiciously pruned over two hours from the film, removing some characters entirely, so that the resultant version (still almost 3 hours in length) concentrates almost exclusively on the couple. This shorter version was released in many countries and proved to be a hit, almost single-handedly reviving Bergman's career. The shortened version has been easy to find, but the full-length television series has been unavailable until now. Thanks to Criterion, we finally have the opportunity to compare the two versions, in a three-disc set that also includes some interesting extras. In the first episode, Innocence and Panic, we're introduced to Marianne (Liv Ullmann), a lawyer specializing in family law (ironically, as we learn later), and her husband Johan (Erlan Josephson), an associate professor at the Psychotechnology Institute. They've been married for ten years, and are a solidly middle-class Swedish couple, with all the expected bourgeois lifestyle accessories�two cars, two daughters, and a summer cottage. Bergman wants to set the stage as quickly as possible, in order to spend more time analyzing their relationship, so he gets all this information out of the way via a fairly audacious narrative device, an interview for a women's magazine. It's through the interviewer's questions that we learn not only about their backgrounds, but also their opinions of themselves as contented and happy�the perfect couple. But we're immediately thrown for a loop, as Johan and Marianne dine with their friends Peter (Jan Malmsj�) and Katarina (Bibi Andersson), who are their exact opposites. As the evening goes on, the cracks in the fa�ade of civility of this second couple rupture and split as they insult each other bitterly and clamor for divorce. Having set up this duality, Bergman begins to explore the fault lines in Johan and Marianne's own relationship in the second episode, The Art of Sweeping Things Under the Rug. The couple tries unsuccessfully to get out of their weekly dinner at Marianne's mother's house, and realize that their lives are too structured, and too dominated by their parents. Bergman presents one possible outcome for their situation, via an interview that Marianne has with a woman who has been trapped in a loveless, if comfortable marriage, and who wants a divorce. But it's during Johan and Marriane's discussion as they prepare for bed that we learn of the first real potential problem with their marriage: a lack of sexual fulfillment. Having brought the topic to the table, they agree to not discuss it, and sweep the topic under the rug. Johan drops a bombshell in the third episode, Paula. He's only just joined Marianne at their summer cottage when he tells her he's in love�with a woman he met fairly recently. Marianne barely reacts, as if she's unwilling or unable to comprehend what Johan is saying, but when he reveals that he's leaving for Paris to spend time with Paula, she breaks down and lashes out. He leaves the next morning, and Marianne is even more devastated and feels completely betrayed when she learns that most of their friends know about the affair. In the succeeding two episodes, The Vale of Tears and The Illiterates, we observe Johann and Marianne meeting over the next few years. In the first, Johan has the upper hand, preparing to emigrate, thus destroying any possibility of reconciliation. Marianne is in therapy and is gradually coming to realize that she has learned to internalize her true thoughts and always present a pleasant exterior. By the time they meet a few years later in The Illiterates, she's clearly the dominant of the two, as her life has blossomed via her own self-discovery, while Johan has suffered through personal and professional disappointments. In the Middle of the Night in a Dark House Somewhere in the World shows us the two many years later, when they've both remarried. It's the latest in a series of irregular assignations, but the first at the old summer cottage. They've both achieved the necessary distance to understand not only themselves and their personalities, but also their marriage and what went wrong. There's a great deal of tenderness between the two as they realize that they still love each other, even if they don't know what love is, and that any attempt to examine their feelings too closely would destroy them. In Scenes from a Marriage, Bergman points a lot of fingers in his analysis of the couple's difficulties, including lack of self-awareness and societal pressures, but it's Johan's and Marianne's parents who are especially singled out. Marianne's parents punished her occasional transgressions severely, and as a result she learned not to express her true thoughts, but rather those expected of her. Her father quashed her hints about becoming an actress, insisting that she go into law (although ironically she has indeed turned out to be an actress, if only in her personal life). And Johan finally admits to himself that he had no interest in a spectacular professional career, but only wanted to fulfill the expectations of his parents. Only by breaking away from their parents (and by extension, society) can Johan and Marianne find a sort of self-contentment, and possibly happiness. Bergman worked with long-time cinematographer Sven Nykvist, and the results couldn't be mistaken for a film by any other director. Bergman's trademark close-ups are everywhere, if less prevalent than in many of his films. The camera often follows a character as he or she moves, rather than cutting from shot to shot, and may suddenly move to the character's face to capture an outburst of emotion. There are telling close-ups�in particular, a shot of Marianne's client's hands as she discusses her loveless marriage, but these are rare, and as a whole there is less self-conscious camera work in Scenes from a Marriage than in many of Bergman's films. This may be partly in response to the theatricality of the film, with its sparse sets and (mostly) two-character set pieces. The performances, as in most of Bergman's work, are stellar. Liv Ullmann can do no wrong in the role of Marianne, as the character learns first to express, then assert herself, at the same time that her marriage is coming undone. She's especially striking in the scene where she learns about Johan's mistress, as doubt, fear, unwillingness to believe, and even sympathy and a kind of pity all mix within her and are played out on her face. The self-centered Johan is a far less likeable character, but Erland Josephson convincingly conveys his growing self-doubt and final acceptance of himself and his position in life. And one wishes for more of Bibi Andersson, whose portrayal of the bitter, cynical Katarina is almost frightening in its believability. While Scenes from a Marriage is an excellent film, the television series is even better. Forced to reduce its five-hour running time, Bergman eliminates entire characters (the children and Marianne's mother) and considerably simplifies the character arcs. For example, in the fourth and fifth episodes, where first Johan, then Marianne dominates, in the series we learn earlier of Johan's difficulties with Paula, and how well Marianne is getting on with her new life. In these two episodes, and indeed the series as a whole, the longer version is far more subtly nuanced, and the television series is definitely the version of choice. Image Transfer Review: Scenes from a Marriage was shot on 16mm Eastmancolor stock, and the transfer just isn't very pleasant to look at. The colors are mostly good for the era, but black levels suffer, to the point of almost solarizing in the final episode. The primary problem is the omnipresent grain, which seems excessive, even given the limitations of 16mm film. Thankfully, the transfer has been digitally cleaned up, so there are no instances of speckles or other source flaws. Audio Transfer Review: The mono audio is fine, given that it was recorded for television. The dialogue (there is no soundtrack music) is at all times clear, without harshness, although a bit of hiss creeps in from time to time. Extras Review: Three video extras are included, one on each of the discs. 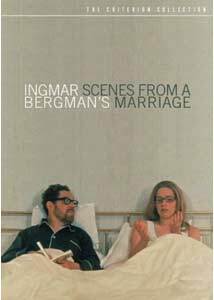 The 1986 interview Ingmar Bergman on Scenes from a Marriage is presented full frame, in Swedish with English subtitles. In its 15m:13s, Bergman discusses how the characters got away from him in the process of writing the script, and how he was surprised at the success of a series that he thought would be of limited interest. He also discusses the influence of childhood on adult behavior, and his own reputation for being easy to anger. The second extra consists of interviews with Liv Ullmann and Erland Josephson (24m:45s), conducted in 2003. They discuss their close friendship, the production history of the series (and Ullman's bad choice of salary instead of percentage) and the reaction upon its release, and how it was based on Bergman's personal life. Ullmann also makes some disparaging comments about the Dogme '95 films, claiming that Scenes from a Marriage was a Dogme film 30 years before they became popular. The interviews were filmed in anamorphic video and look stunning. Bergman scholar Peter Cowie places the series in the context of Bergman's career in Peter Cowie on the two version of Scenes from a Marriage. Its 14m:56s running length also includes comments on the differences between the television and screen version, although these are rather brief, leaving one wanting for more. The full-frame image also includes clips from the film. Most of the 12-page printed booklet is unfortunately given over to photographs, credits, and a chapter listing, but in the remaining three pages, Phillip Lopate discusses influences on Bergman's style, the structure of the series, and the excellent performances. Swedish director Ingmar Bergman masterfully dissects the inner workings of the failing marriage of a middle-class Swedish couple in Scenes from a Marriage. Criterion's package includes both the truncated theatrical version and the superior television series. The transfer is a bit problematic, but the extras are very worthwhile.